As I may have mentioned earlier -- just can't remember! 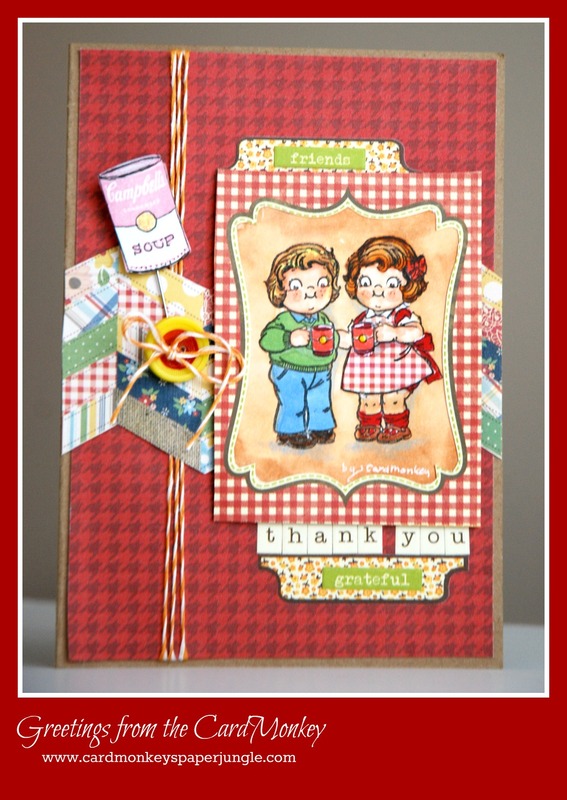 -- this month, I am hosting a swap of stamped images on a Facebook page called "Karle's Passion". When Karle herself sent her images to me for sharing with the 12 others in the group, she also included a nice assortment of extra stamped images just for me, to say thank you. This cute image of the iconic Campbell Soup kids was one of the black-and-white images Karle sent. I colored the image using Copic Markers, paper pieced the girl's apron using Simple Stories "Summer" paper and highlighted with both black and white gel pens. For the card, I used a Kraft paper base. I covered it in Jillibean Soup background paper that I wrapped in Jillibean orange twine. The patchwork chevron is also from the same Simple Stories paper pack, trimmed to size. The sticker embellishments are also by Jillibean. Karle also sent the Campbell Soup can stamped in red, which I highlighted in black ink and yellow marker and mounted to a stick pin. The yellow button (from my stash) was colored in its center red, using a Copic Marker, and tied onto the twine. Cute card. I always thought those two little Campbell's kids were adorable. 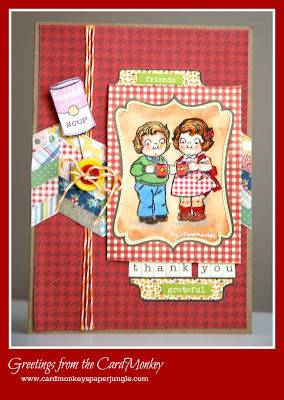 LOVE this card - turned out super cute!